IAYP Holds the National Training Workshop at Jodhamal Public School Jammu. National Award Authority India conducted the National Award Training for IAYP at Jodhamal Public School Jammu wherein the 25 Award Leaders from Jammu & Jalandhar participated. National Programme Manager BivujitMukhoti along with Gold Awardee Pallavi Gill conducted the first day of the Award programme with full enthusiasm whereas the second day saw the National Director National Award Programme in India an off shoot of the Duke of Edenburgh’s Awards UK who addressed the gathering and asked them to ensure the award is implemented in their schools in letter and spirit for producing the better citizens to the Globe. Sanzida Ali the Regional Director Asia Paciffic also took the session on the Online Record Book ( ORB) and asked every award leader to switch to ORB in this digital world.Sanzida Ali came all the way from Australia for this Programme at Jodhamal. BivujitMukhoti told the participants that the Award Programme was first introduced in the United Kingdom in 1956 as the Duke of Edinburgh’s Award. The aim was to motivate young people aged between 14 and 25 years to become involved in a balanced programme of voluntary self-development activities to take them through the potentially difficult period between adolescence and adulthood. The Award’s concept is one of individual challenge, giving young people a balanced, non-competitive programme of voluntary activities which encourage personal discovery and growth, self-reliance, perseverance, responsibility to themselves and service to their community. Those who participate in the Award are expected to follow its requirements in a non-competitive manner with a determination to succeed, either individually or as part of a team. The Award therefore is challenging, and can be undertaken at one's own pace. The Participation Age is between 14 and 25 years. The basic structure of the Award consists of 4 mandatory sections Service, Adventurous Journey, Skills and Physical Recreation. There are 3 levels of the Award – Bronze, Silver & Gold. Participants must complete the four mandatory sections of Service, Adventurous Journey, Skill& Physical Recreation. The National Award Training was attended by DAV School , A Pee Jay Jalandhar, KC International , Banyan International School, Jammu Sanskriti Jammu, Jammu SanskritiKathua, Model Academy , Government High School Kathua, Government High School Deelietc and the best part of the Programme was giving space to each participant to showcase his /her skill and each one was given space to put their points across. KapilBhalla said that Jodhamal is among the Best Schools of India when it comes to the award achieved by the students of a school and almost 650 students of Jo0dhamal have received the Gold, Silver & Bronze Levels in the past years and many students got the admissions in the foreign Universities on scholarships due to their association with the award journey. 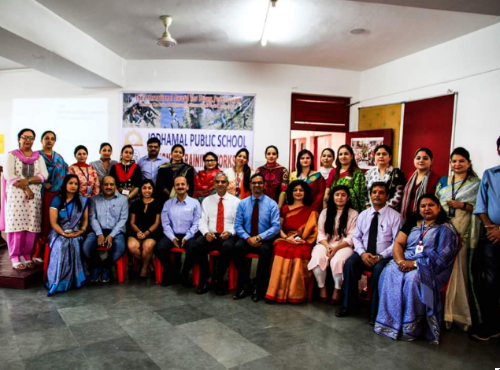 Principal Trilok Singh Bist also attended the Workshop and felt that the best part of the Workshop was the Collaboration of the Government and Private schools and according to him both contributed equally in their areas of expertise while giving the presentations. All participants from the different schools showcased their skills in the skills section in terms of singing, dancing, art, craft or Judo etc. The overall coordinator for the Award Programme at JodhamalShallu Sharma said due to the format of the Programme where at the most 20 to 25 participants can be taken they could not extend the invitation to all schools in Jammu, but they are looking forward to make it available for other schools in the future. Principal Trilok Singh Bist and Trustee NandanKuthiala appreciated all school Principals who took the benefit of this Programme at their doorstep and gave special appreciation to IAYP Coordinator Shallu Sharma for her meticulous planning and execution. Jodhamal Public School under the Public Private Partnership adopted three government schools namely Govt. High School, Deeli, Govt. Primary School, Sainik Colony, Govt. Primary School, Prithvipur. Since April 2016, Jodhamal Public School adopted these three schools for the development of these schools and carrying out extra co-curricular activities among the students of the Govt. schools. Jodhamal School has also launched a R. B. KuthialaJodhamal Education Foundation Scholarship for girls studying in Govt. schools in the border area of Jammu Province. The modalities of the scholarship are still being worked out and would be open for girls of classes 9th to 11th. Teachers from Jodhamal had been going every week to these schools to carry out activities and to develop spoken skills among these children together with providing notebooks, pens, pencils, black boards, fans etc. for the school as and when needed. Jodhamal made Govt. High School, Deeli students participate in National level competitions like VoxPopuli and Polifest. Two students of Govt. High school Delli were sponsored for the National Level Tech Summit at Vasant Valley School in New Delhi and both the boys Lekhraj and Pawan gave a very good presentation and won accolades from one and all. Today, in a special event, Jodhamal organized a Public Private Partnership initiative to set up Libraries in all three Govt. Schools and Minister of State Education Honourable Mrs. Priyasethi presided over as the Chief Guest. Mr. NandanKuthiala and MrsAratiKuthiala had been generous enough to think of these children who otherwise are deprived of the basic facilities. Govt. School Students presented NukkadNatak on Destiny and the junior kids of Jodhamal presented NukkadNatak on BetiBachaoBetiPadao. Jodhamal is not only honing up the skills of the students but also developing their overall personality by making them participate in different activities and NukkadNataks.PrincipalJodhamalTrilok Singh Bist gave the report on how after meeting the Honourable Governor he was made to meet the then Education Minister JanabNaeem Akhtar who in turn made the then Director Education SmithaSethi to visit the schools and allot the schools to Jodhamal under the PPP. Present on the occasion were S. Ravinder Singh, Director Education, Mr. J K Sudan, Chief Education Officer Jammu and the Head Masters of all three govt. school, teachers and students of all schools including Jodhamal. Programme was anchored by PrakharBist of Jodhamal and Leena Chandra of Govt. High School, Deeli. Mrs. PoojaPanthri, Vice Principal of Jodhamal presented the vote of thanks. Ms. Sunita Gupta Incharge Head Master of Govt. High School, Deeli thanked Jodhamal Public School for the unconditional support provided under the Public Private Partnership. The IAYP InchargeShallu Sharma, Junior Coordinator Sonia Mahajan and the eight teachers who have contributed to this noble cause were also there to share their experiences and the sense of contentment and satisfaction by being the part of this Community Service for last two years. Jodhamal Public School hosts UN Collaboration Debate under the aegis of Gandhi Global Peace Foundation held a programme on " Clean water and sanitation", to bring about the change we want to see in the society. A delegation of very aware speakers put forward the most crucial issue of water especially clean water in such a way that importance and most importantly, judicious use of water was under stood by one and all. Ms Sana Dua, Femina Miss India North Zone finalist was the chief guest and Mr Gaurav Sharma & Ms Payal Jain the guest of honors. Ms Sana Dua initiated the "Lets Do it Jammu movement to save water ". The aim of the whole the exercise is to bring awareness about water conservation amongst the youth of the city. A tank to collect the unused water from the studen's water bottles was installed. The water collected in this tank would be utilized to irrigate the trees in the campus, she also held an interactive session with the students on the above topic. The Gold, Silver And Bronze medals were awarded to Jodhdeep Singh, Mohd Raza and and Vidur Kumar respectively. Members of the schools Environment club, THE ECO BUDDIES, showed Sana Dua the integrated water harvesting system of the school buildings, which is helping the recharging of the water table of the area. The School Trustee Mr Nandan Kuthiala on behalf of the school wished Ms Sana Dua luck for the upcoming Femina Miss India competition in Mumbai. The programmed was campered by Ms Nandini Bakshi , Ms Pritibha Sapori and Ms Roopinder Kour.